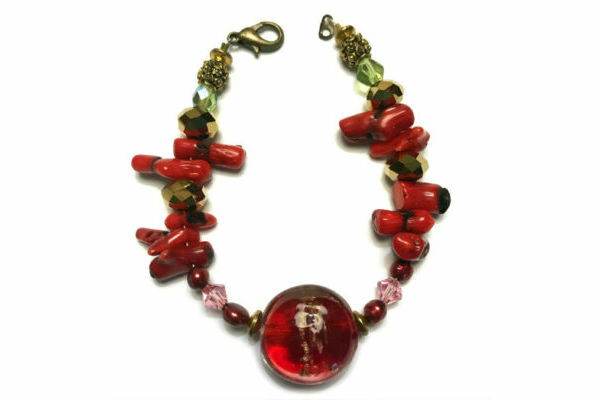 This amazing Harlem Girl necklace is a one-of-a-kind handcrafted after months of work using focal lampworked glass beads, pearls, bamboo coral, crystals, antique gold metal disks, and gold beads by jewelry designer Montanette Jones created with that Harlem Girl during the second Harlem Renaissance. Related: Shop Harlem World 2018 for the holidays. In this partnership with Harlem World Magazine, Montanette selected her stones with the wellness our readers in mind. She curated coral stones that were selected to bring diplomacy at work, positive emotions day in day out and to have clear visualization of goals in the wearers life. The 7.5′ necklace is completed at the top with gold metal clasp and filigree beads. Shipping included. Proceeds will be donated to Harlem World Cares. This entry was posted in artisanal, Harlem, Harlem World Gear, Shop Harlem World and tagged artisan, bamboo coral, crystals, focal lampworked glass beads, Harlem renaissance, Harlem World Cares, Montanette Jones, pearls, Shop Harlem World, wellness by Harlem World Magazine. Bookmark the permalink.